Three Rivers Press (CA), 9780307337955, 308pp. Day's Pharmacy is tight quarters, and for Andy and Gregory, the mixture is explosive. Unable to win Gregory over, Andy devises a surefire scheme to secure his blessing to marry Paige. But what Andy doesn t realize is that the only way he ll make it to the altar is if he protects his future father-in-law's big secret. In so doing, he ll have to fend off financial ruin, Paige's aggressive ex-boyfriend, and an intimidating crime ring of geriatric gangsters. For young Andy, charting the path to true love will take sheer ingenuity. ALEX WELLEN is a writer, inventor, and Emmy Award winning television producer for CNN who lives in Washington, D.C., with his wife and son. He is the author of the critically acclaimed memoir Barman. This is his first novel." "A delightful romantic comedy with unexpected humor and a wacky cast of supporting characters." "Alex Wellen's engagement story is such a doozy, he lifted it frame by frame for his romantic, laugh-out-loud-funny first novel, Lovesick." "Pulling back the curtain on what men really think about getting married." "A screwball comedy about small-town love." "In his new book, Lovesick, CNN deputy political director Alex Wellen offers a new twist on the concept that only women want to get married." 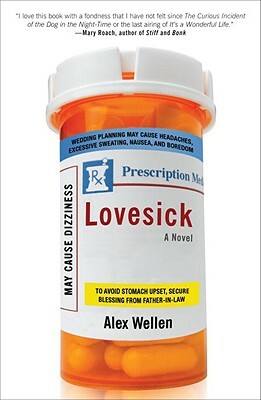 "In the book Lovesick, Alex Wellen has created a character who steals our hearts from the first page. Andy just wants to marry the love of his life, Paige, but first he has to overcome the overt hostility of her father–who happens to be his boss–and the skulduggery of a group of geriatric goof balls." "I love this book with a fondness that I have not felt since The Curious Incident of the Dog in the Night-Time or the last airing of 'It's a Wonderful Life.' It's warm and funny and true, and I did not want it to end." "Packed into this inventive, hilarious tale of small-town domestic realism is a parable for our times." "Lovesick is a fresh, funny look at the rocky road to real love and a happy marriage. Andy Altman is an ordinary-guy hero with extraordinary heart and the story Alex Wellen creates around him is as touching as it is entertaining. As for Andy' s best pal, 83-year-old Sid — don't get me started!! He's the kind of character that jumps off the page and sticks with you for a long, long time. Read Lovesick. You'll feel better about everything!!" "Alex Wellen has created memorable characters with emotional honesty, depth, and a great sense of humor. Andy and Paige will leave readers feeling simultaneously conflicted by their choices and warmed by the authenticity of a relationship that began when they were children. Lovesick is a must-read for anyone who believes that love conquers all, even when everything seems to stand in the way." "A humorous look at the adventurous transition from engagement to marriage."